GLAUB has been selling robot arms that can be used to make production steps even more efficient for three years. 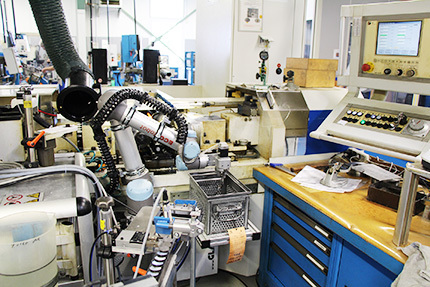 Its ECO/Robot model now also plays a role in the production of screws and bolts for the aerospace engineering industry as a tool used for the routine loading of a thread rolling machine. Thread rolling machines offer users a number of benefits, for example by enabling them to produce high-quality bolts and screws that are also extremely solid. One of our customers recently approached us to discuss the possibility of making this production step more economic. When exploring the use of thread rolling machines, the industrial company had considered two justifiable questions: Do thread rolling machines really still need to be loaded manually? Can this process not be made more efficient? When the company approached GLAUB regarding this matter, it received a positive response, namely: ”of course it can!". After all, when it comes to automatic loading processes, GLAUB offers its customers the ideal specialist. This specialist, which goes by the name of ECO/Robot, is a reliable expert for the completion of extremely repetitive manual work steps. This multi-talented tool not only enables companies to significantly decrease their costs per unit, but is also easy to operate and approved for use in collaborative applications. Our customer was also impressed by this multitude of benefits offered by ECO/Robot and therefore decided to join forces with GLAUB to develop its desired work process for its thread rolling machine, which requires ECO/Robot to take a screw from a vibrating unit before inserting it into a induction system and initiating the heating procedure. After completing these steps, the robot then needs to remove the screw from the system, load it into the thread rolling machine and start the ”Roll thread” process before finally loading the finished screw into a box. On top of these requirements, the customer also requested that it remain possible to rapidly switch back to manual loading for the production of small batches at all times. Meeting all of these requirements meant a lot of hard work for GLAUB, which began by fitting ECO/Robot with an electric gripper. The company then 'taught’ the robot different positions in order to enable it to grip different types of screws before finally adding a quick-lock function so that the customer can quickly switch back to manual production where required. Every single stage of this process was carried out at GLAUB’s own facilities, from the mechanical development through to the electrical wiring and right through to the programming of interfaces. All of these stages resulted in a successful team of machines that acts as a further example of how cost-effective robots can be used to increase a company's production efficiency.